Hummus. You've seen it at about every potluck/dinner party these days. You've probably bought a giant tub of it before. You've probably never made it yourself though, and lucky for you, it's super simple! You just chuck a bunch of ingredients into a food processor, and voila! you have a dip that deceptively makes you feel better about your hips than ranch dressing does. 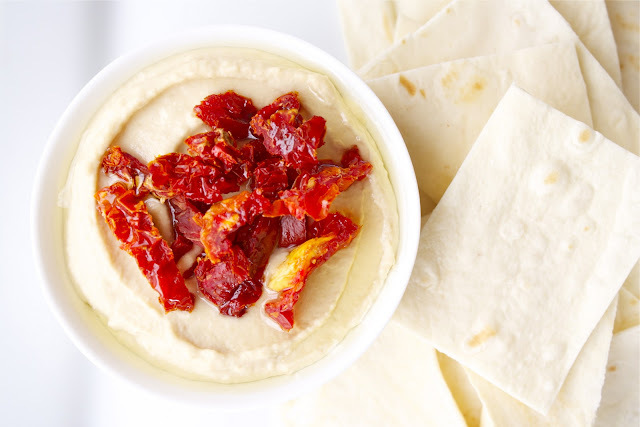 I like to garnish my hummus with a drizzle of olive oil and either paprika or some sun-dried tomatoes, and serve with some cut up pita bread (that's on the list of things to bake!). 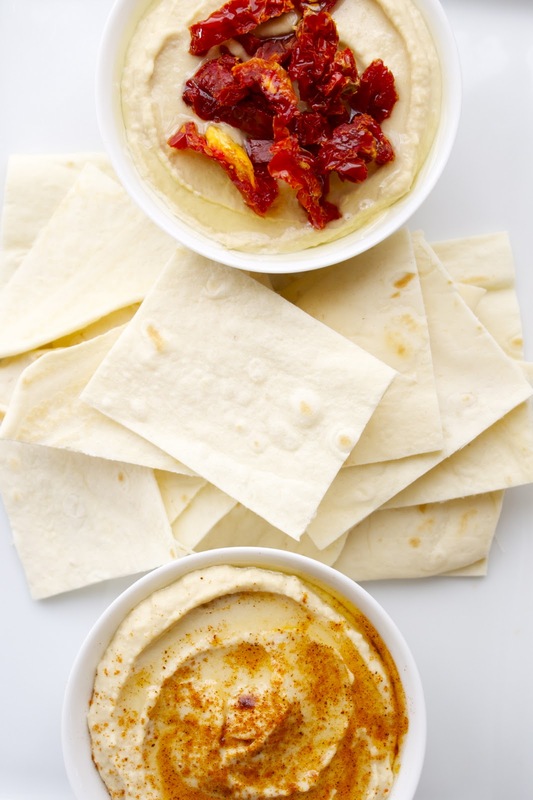 But hummus doesn't just have to be an appetizer. You can pretty much spread it on whatever you like. I like to put it in my sandwiches and wraps for lunch. This hummus takes five minutes to make, so try it out the next time that you have a party or want to switch up the lunch routine. And most importantly, enjoy. Place all ingredients in a food processor and blend until evenly mixed and smooth (about 3 minutes). Place in a serving bowl and top with olive oil and other garnishes (paprika, sun-dried tomatoes, parsley, pine nuts, cumin, etc.). Looks incredible. I have a soft fluffy pita recipe that would go great with this. Making this tomorrow. Thanks for sharing! Love hummus and love this recipe! I LOVE homemade hummus! I don't make it often...but it is SUCH a treat! I always prefer homemade hummus! Yours looks delicious! Ah, thank you for sharing! 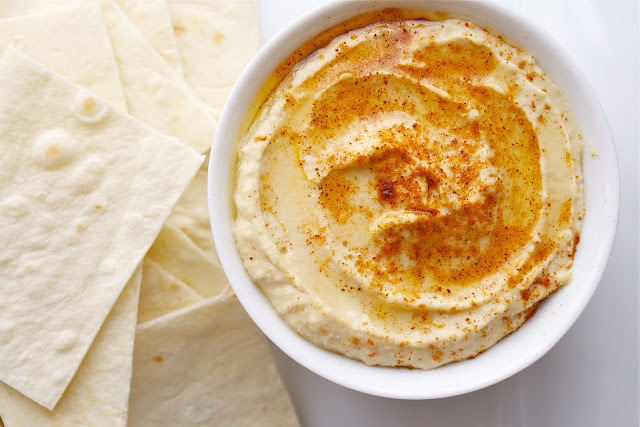 I've been looking for a good homemade hummus recipe for so long. This looks great! Great photos. Love the SD Tomatoes on top. Oh this looks so good, and I have all the ingredients to make it. Bookmarked! ooh this looks delicious and really simple. And you're right, I've never made my own hummus before even though I bring a tub of Sabra to every potluck. 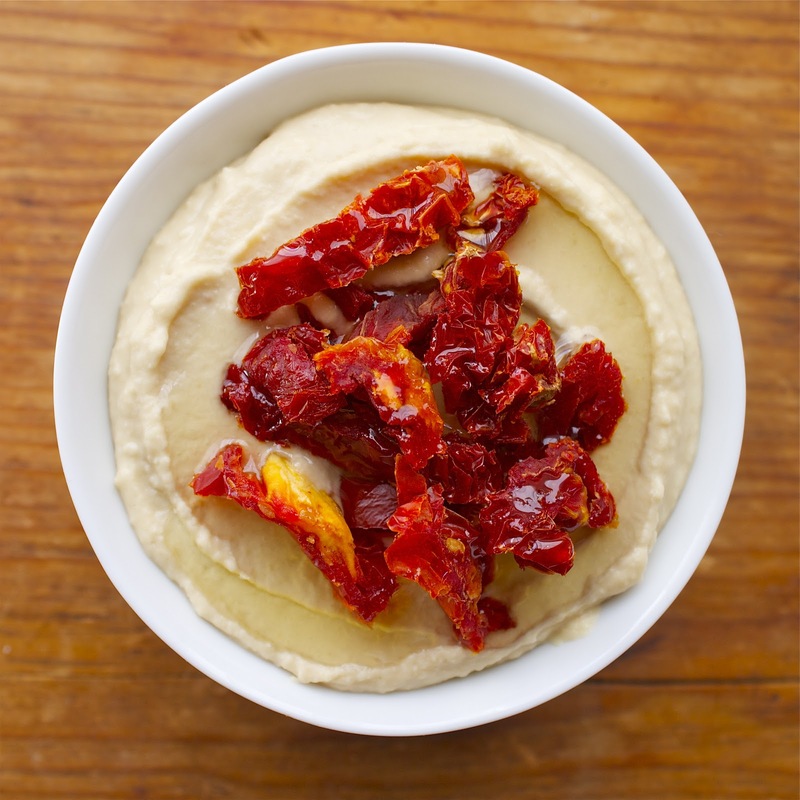 Mmmmmm...hummus is on my list to make this week...and I think I'll be garnishing with sun-dried tomatoes for a change :) YUM! Yum! This is one of my favorite things to make. I like to add a little cayenne, sometimes pesto, roasted red peppers, or olives. You can also use yogurt instead of water for extra protein & a creamier consistency. Thanks, Ingrid: Hummus Goddess! I will definitely do the yogurt trick next time and I'm always looking for an excuse to put pesto in anything, haha. 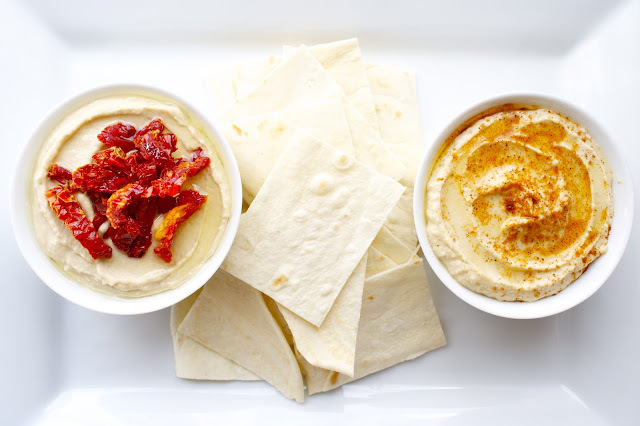 i liked your serving way of humus. i really love this meze( appetizer ) very much. if you can find tahini made by double roasted sesames. i highly recommended you to try this receipe with it.